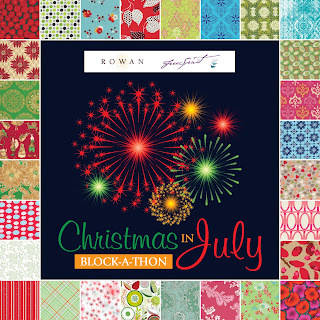 Kelsey Creates: Christmas in July Block-A-Thon! Hey everyone! I have some very exciting news! Free Spirit will be kicking off the Christmas in July Block-A-Thon in just a few weeks, and I get to participate alongside some amazing bloggers! Below is the list of bloggers that will be participating and showing you how to create some fantastic blocks. So be sure to check out their sites and watch Free Spirit Fabric's blog for each block tutorial. It is a jam packed month with lots of blocks, but if you do not get them done in the short amount of time, Free Spirit will be putting together an E-book that will have all the blocks and tutorials inside so you can go at your own pace. 2 GRAND PRIZES include all the fabrics to create the Christmas in July quilt. They will be randomly selected at the end of the QAL. Also, if you are joining in, grab our button on the sidebar to post on your blog!